The Cumbres & Toltec Scenic Railroad from Antonito, Colorado to Chama, New Mexico is a living time machine were one can recreate scenes from the 1950’s or before. 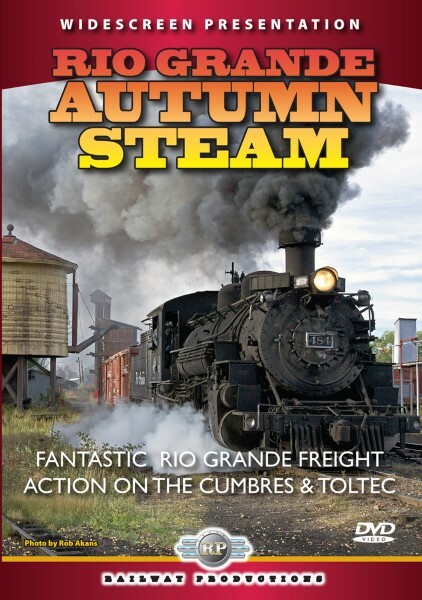 In “Rio Grande Autumn Steam, enjoy freight trains that look just like the 1950’s or ‘60’s along this amazing 64 mile line. Watch a freight from Chama to Cumbres with steam locomotives on the front and rear, just like the Rio Grande Railroad used to do, followed by a second section with a single steamer. You’ll also see a one engine freight out of Antonito. Then, thrill to the action as a 30+ car freight travels from Antonito to Cumbres, with a mid-train helper, again just like the Rio Grande used to run through here. A fantastic documentary that any steam locomotive enthusiast will enjoy. 90 minutes. DVD contains chapter menus and narration on/off.